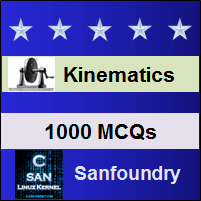 This set of Machine Kinematics Interview Questions and Answers for freshers focuses on “Numericals On Kinetics Of Motion and Loss of Kinetic Energy”. 1. A road roller has a total mass of 12 tonnes. The front roller has a mass of 2 tonnes, a radius of gyration of 0.4 m and a diameter of 1.2 m. The rear axle, together with its wheels, has a mass of 2.5 tonnes, a radius of gyration of 0.6 m and a diameter of 1.5 m. Calculate kinetic energy of rotation of the wheels and axles at a speed of 9 km/h. 2. A road roller has a total mass of 12 tonnes. The front roller has a mass of 2 tonnes, a radius of gyration of 0.4 m and a diameter of 1.2 m. The rear axle, together with its wheels, has a mass of 2.5 tonnes, a radius of gyration of 0.6 m and a diameter of 1.5 m. Calculate total kinetic energy of road roller. This energy includes the kinetic energy of translation of the wheels also, because the total mass (m) has been considered. 3. A road roller has a total mass of 12 tonnes. The front roller has a mass of 2 tonnes, a radius of gyration of 0.4 m and a diameter of 1.2 m. The rear axle, together with its wheels, has a mass of 2.5 tonnes, a radius of gyration of 0.6 m and a diameter of 1.5 m. Calculate braking force required to bring the roller to rest from 9 km/h in 6 m on the level. Let F = Braking force required to bring the roller to rest, in newtons. 4. A haulage rope winds on a drum of radius 500 mm, the free end being attached to a truck. The truck has a mass of 500 kg and is initially at rest. The drum is equivalent to a mass of 1250 kg with radius of gyration 450 mm. The rim speed of the drum is 0.75 m/s before the rope tightens. By considering the change in linear momentum of the truck and in the angular momentum of the drum, find the speed of the truck when the motion becomes steady. F = Impulse in rope in N-s.
5. An electric motor drives a machine through a speed reducing gear of ratio 9:1. The motor armature, with its shaft and gear wheel, has moment of inertia 0.6 kg-m2. The rotating part of the driven machine has moment of inertia 45 kg-m2. The driven machine has resisting torque of 100 N-m and the efficiency of reduction gear is 95%. Find the power which the motor must develop to drive the machine at a uniform speed of 160 r.p.m. 6. The flywheel of a steam engine has a radius of gyration of 1 m and mass 2500 kg. The starting torque of the steam engine is 1500 N-m and may be assumed constant. Determine : Angular acceleration of the flywheel. Let α = Angular acceleration of the flywheel. 7. The flywheel of a steam engine has a radius of gyration of 1 m and mass 2500 kg. The starting torque of the steam engine is 1500 N-m and may be assumed constant. Determine : Kinetic energy of the flywheel after 10 seconds from the start. First of all, let us find the angular speed of the flywheel (ω2) after t = 10 seconds from the start (i.e. ω1 = 0 ). 8. Which of the following objects have momentum? a) An electron is orbiting the nucleus of an atom. b) A UPS truck is stopped in front of the school building. c) The high school building rests in the middle of town. Explanation: Momentum can be thought of as mass in motion. An object has momentum if it has its mass in motion. It matters not whether the object is of large mass or small mass, moving with constant speed or accelerating; if the object is MOVING, then it has momentum. Explanation: Momentum is directly related to the mass of the object. So for the same speed, a doubling of mass leads to a doubling of momentum. 10. A ball is dropped from the same height upon various flat surfaces. For the same collision time, impulses are smaller when the most bouncing take place. Explanation: Since being dropped from the same height, the balls will be moving with the same pre-collision velocity (assuming negligible air resistance). Upon collision with the ground, the velocity will have to be reduced to zero – that is, the ball will cease moving downwards. This decrease in velocity constitutes the first portion of the velocity change. If the ball bounces, then there is an additional velocity change sending the ball back upwards opposite the original direction. Thus, for the same collision time, bouncing involves a greater velocity change, a greater momentum change, and therefore a greater impulse. To practice all areas of Machine Kinematics for Interviews, here is complete set of 1000+ Multiple Choice Questions and Answers.